Client demand: achieve greater comfort and wellness in heating and cooling by reducing air drafts and optimizing ownership costs. 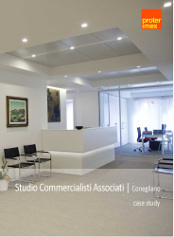 Client’s demand: restoration of “Casa degli industriali”, built in the 1963 and used as offices. Client’s demand: to combine energy efficiency, sustainability and architectural design in an innovative way. Proter Imex contributed to this ambitious project making the heating and cooling radiant ceiling on a surface of 400 square meters.